Homeland Thanksgiving Day in Croatia falls on August 5th each year and commemorates Operation Storm that gave Croatia is independence in 1995. People celebrate the day by attending parades, church service, and concerts. 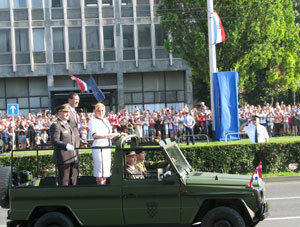 Many of the festivities are held in Knin but people throughout the country take part in the day. This day is a national holiday with most government and business offices closed. Croatia had been a part of Yugoslavia since 1918 but decided in 1991 to separate and gain its independence which started the Croatian War of Independence. This war was fought over 4 years culminating in a victory of the battle of Operation Storm.